Glaucoma is a disease of the optic nerve – the part of the eye that carries the images we see to the brain. The optic never is made up of many nerve fibers, like an electric cable containing numerous wires. When damage to the optic nerve fibers occurs, blind spots develop in our vision. These blind spots usually go unnoticed until the optic nerve is significantly damaged. If the entire optic nerve is destroyed, blindness results. The most common form of glaucoma is chronic open angle glaucoma. 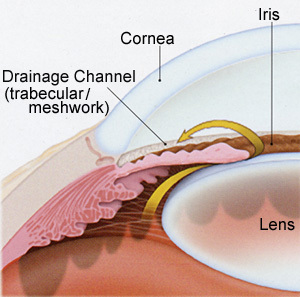 In this condition, a part of the eye called the drainage channel becomes less efficient at draining microscopic amounts of fluid from the eye over time, allowing pressure within the eye to gradually increase. The increased pressure slowly and painlessly destroys the nerve fibers in the optic nerve. Eyes have different abilities to withstand eye pressure. Some people can even develop glaucoma damage at normal pressures. When someone is at high risk for further nerve damage, treatment to lower eye pressure is necessary to prevent further vision loss. Early detection and treatment by your ophthalmologist (Eye M.D.) are the keys to preventing blindness from glaucoma. How can Selective Laser Trabeculoplasty (SLT) help treat open angle glaucoma? Selective Laser Trabeculoplasty (SLT) uses a neodymium:YAG laser to focus light energy on the internal drainage channel of the ye. SLT targets the pigmented (melanin-containing) cells in the trabecular meshwork using a very short application of light. Because SLT uses a low amount of energy, the surrounding tissue is not damaged. The treatment allows the drain to work more efficiently, successfully lowering pressure more than 80 percent of the time. After SLT, your eye pressure may increase over time. By five years, up to half of people treated with SLT experience a rise in eye pressure. Your doctor will need to continue to monitor your eye pressure and can repeat the SLT treatment if needed, although retreatment may not be as successful as the initial treatment. Laser surgery can reduce the amount of medication you may need and is often recommended when you have trouble inserting eyedrops or are not using eyedrops on a regular basis. SLT can also be used in addition to medicines or as a first line of treatment. There are always risks associated with medications and surgery. However, the risks should be balanced against the greater risk of leaving glaucoma untreated and losing your vision. If you have any questions about for glaucoma, you should discuss them with your Eye M.D. The procedure is done in the ophthalmologist’s office or a laser treatment center and usually takes less than 10 minutes. First, anesthetic eye drops are used to numb the eye. Additional drops are given to control eye pressure, pupil size and inflammation. While you are seated at the examining microscope, the laser energy is then focused through a lens to treat the drainage channel (trabecular meshwork). You will experience a flash of light with each laser application. There is rarely discomfort with this treatment. After treatment your eye pressure will be monitored approximately one to two hours after the procedure. Very rarely, eye pressure can rise, requiring additional treatment. Anti-inflammatory eyedrops are often prescribed for several days after the procedure. Your vision may be blurry immediately after treatment but should clear within hours, sometimes overnight. Most people can return to their normal activities the day after surgery. It will take several weeks for the laser treatment to take full effect. Your doctor will want to check your eye pressure one to two months after the procedure. If you eye pressure is not lower at the first visit, some additional effect can be gained up to three months after treatment. If lower eye pressure is needed, your Eye M.D. will help you decide whether additional laser treatment, medication or other surgery is required.